Here is a complete guide to determining the best body lotion for you that has the best ingredients to protect and moisturize your skin. Did you know that the largest organ in the body is skin and it is made up of 64% water? The outermost layer of the skin and a complex structure called stratum corneum is the one responsible protecting the important tissues. It is this structure that is responsible for your great skin and holds up fatty acids called lipids and water that protect the skin. If the skin gets too leathery, scaly, flaky or itchy, it means that the stratum corneum is too dry and is lacking water. This usually happens in very dry or very cold weathers and is an indication that a good body lotion for the skin is a must. This is because the skin is dehydrated and is unable to repair itself and will age rapidly if not attended to. Regular use of a body lotion will help your skin retain that water. But as is the case with all beauty products, shelves in supermarkets and drugstores are laden with a confusing array of choices, making it difficult for you to select the right one for you that will not cause an undesired effect on your skin. The many products that are available are in many forms, namely lotions, creams and ointments and can confuse you if you didn’t know what you should be looking for. What Should the Best Body Lotion Have? Occlusives - These are the ingredients that help the prevention of evaporation of water from your skin by creating a block and retaining the moisture. Some of these are petroleum jelly (otherwise known as petrolatum), waxes (paraffin), mineral oils, lanolin, silicone derivatives and botanical and beeswax. Some of these, such as lanolin, are not suitable for every type of skin. Humectants - Humectants are active ingredients that attract water to the protective layer, the stratum corneum. They hydrate the skin by drawing water in extremely humid conditions or from the dermis. Some known humectants are panthenol, glycerin (very inexpensive and effective), propylene glycol (slightly smoother than glycerin) and hyaluronic acid among many others. Emollients - Emollients fill the gaps between cell clusters, giving them the appearance of smoothness and can even seal the moisture in, in some instances. They also make the skin pliant and soft. Emollients number in hundreds and to name them all would be pointless, but some of them include jojoba oil, shea butter, plant oils (non-fragrant), fatty acids and cholesterol. A balanced body lotion will contain some of these ingredients listed above, along with other components that nourish and balance the skin. These are anti-irritants, antioxidants and other agents that communicate with your skin cells and are important if you want to see comprehensive enhancement in your skin tone. Antioxidants help greatly in slowing down premature aging and are hence a natural preservative. These are vitamins A, B and C and boost your skin’s ability to produce healthy collagen (the main structural protein in the skin) and heal itself. Anti-Irritant Ingredients - These are other important components of a good body lotion, especially if you have sensitive skin. Irritants break down collagen that naturally protects your skin and keeps it looking healthy and young. Anti-irritants protect your skin from the effects of external factors such as the sun, pollutants or damage caused by other beauty products. These include grape extracts, green tea and aloe. Even otherwise, say if you have normal skin, it is important that you avoid products that contain irritants. You may particularly favor a product because it smells divine and makes you feel good, but always remember that scent is one of the topmost irritants that are present in most body lotion products. Sun Creams - Popularly known as sunscreen, this ingredient helps protect your skin, because too much exposure to the sun will start making you look older than you are. But do not go overboard with it also, because if the sunscreen component of a particular body lotion is higher, it might not have other ingredients in the required quantities. At the same time, if your skin is very sensitive, dry or mature, you can give this ingredient (in a body lotion) a pass altogether; and apply sunscreen after you have applied the body lotion. If your skin is parched or cracked, you will need a lotion that is oil based and contains emollients and exfoliates it. Petroleum-based ingredients such as paraffin and mineral oil are great for such skin. If your skin is affected by winter and extreme weather, you might want something with a thicker consistency which seals in the moisture. Consider yourself lucky because your skin is “low maintenance”. And exactly for the same reason, it can be easily neglected. The best course of action would a cleansing wash and then applying a lotion with gentle components, which may include jojoba or aloe derivatives. If you have oily skin, you may have been led to believe that you don’t need a body lotion because your skin produces enough collagen for you. But if not moisturized properly, it will lead to symptoms of premature aging. To avoid that, choose a lotion which is oil-free and light and contains ingredients that will not block your pores. If your skin reacts easily to any cosmetic products, then you need a lightweight body lotion. The lotion should be free of known irritants such as heavy perfumes or dyes. You would need something that protects the skin’s barrier and has long-lasting hydration and quick absorption. Recommended ingredients in the body lotion for this skin type are chamomile and aloe. There are a great many skin products, but a majority of them are surprisingly for, you guessed it correct, your face! It is indeed curious how much time and money we spend making that small portion of our body look good and ignore the rest of it. 100% SATISFACTION GUARANTEED: Natural, non-toxic, hypoallergenic, vegan, gluten-free, biodegradable; Certified Cruelty Free - Never Tested on Animals; Made in the USA! The manufacturers of this lotion claim that you will start seeing noticeably smoother skin right after the first use! This all-natural (99.95% natural) product has been made in the United States and is packed with rich, hydrating, plant-based ingredients to provide all-day moisture, without being greasy; it leaves no residue on your fingertips and is absorbed quickly. The formula is free and hypoallergenic, making it safe to use on all skin types anywhere (hands, feet, face or anywhere nourishment is required) and has been formulated by doctors. Contains no parabens, fragrances, nut-based ingredients or petrochemicals. It is 100% cruelty-free and has not been tested on animals. The product is vegan and contains no animal by-products and is gluten-free. Even the packaging is environment friendly and recyclable. The product itself is biodegradable. Enriched with natural ingredients such as shea butter, vitamin E, green tea oil, jojoba, vitamin c and aloe, that provide deep hydration. Just a little goes a long way and provides all-day moisture. Can be used by the whole family, especially those with dry skin. Does not contain any harmful fragrance. Doesn’t clog pores or leave a greasy residue behind. Some customers can be put off by the organic smell of the product. 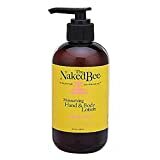 This natural product (70% certified organic) by The Naked Bee is a hypoallergenic lotion and packed with moisturizing nutrients that leave the skin beautiful looking and comes with great fragrances (sans phthalates) that are soft on the senses and are invigorating. It also contains antioxidants such as white and green tea that protect the skin from stress and hence increase the longevity. It also contains no parabens, dyes or pigments and is suitable for all skin types. Available in three amazing scents, namely grapefruit blossom honey, coconut and honey and contains no parabens, gluten and phthalates. 100% cruelty-free, has not been tested on animals. Contains nutrient-rich spirulina that is great for skin detoxification and conditioning. Contains no ingredients that cause common allergies. Some customers have complained about a defective pump mechanism on the bottle. Customers with dry skin swear by this product, with several claiming that they saw the results right after the first use and visible improvement within the first two weeks. The lotion contains rich emollients that protect the skin all day long and leave your skin feeling smooth and soft. It contains no fragrance, is non-greasy and the brand is trusted because of its use of natural ingredients in its products. Protects and prevents from the effects of extreme weathers. Only one application is enough, but can be used as desired. Does not aggravate any skin diseases that you may have. A great oatmeal formula that sinks into the skin immediately. Relieves dry skin, keeps it moisturized all day long. Some customers may find the lack of SPF in the lotion a deterrent. Hempz Pumpkin Spice & Vanilla Chai Herbal Body Moisturizer 17 oz. This moisturizer comes infused with 100% pure hemp seed oil that conditions and soothes your skin; the amazing smell that lasts for hours is a bonus! It doesn’t leave a greasy, heavy feeling after application and hydrates the skin. It has the natural goodness of shea butter which not only helps moisturize the skin, but, at the same time the nutrients enable it to fight against daily elements. Does not contain any parabens, gluten or THC. It is also 100% vegan. Contains 100% pure hemp seed oil. Contains cinnamon extracts that condition and stimulates the skin. Calm, gentle smell that lasts for hours! The pumpkin extracts help improve your skin tone and resilience. Contains antioxidants that protect and condition the skin. Contains vanilla extracts that calm and soothe the skin. Some customers may not like the pumpkin smell too much.  A SPLASH OF ORGANIC MOISTURE FOR DRY SKIN: Experts agree, when you balance your skin's pH, instead of just coating it in oils, it naturally balances its own moisture. That's why our lavender lotion contains the amazing soapberry. Along with Organic Healing Moisture Botanicals it nourishes, hydrates and calms irritation, leaving moisture without residue! Naturally it's what dry, sensitive skin is thirsting for.  SKIN FEELS SOFT AND HYDRATED: For healthy skin, you must maintain its acidic pH around 5.5. And that's exactly why soapberry has been used for millennia. We simply added Organic Shea Butter, Cocoa Butter, calming Oatmeal, Aloe Vera and Chamomile. So for eczema, winter dryness, flaking, dry hands and feet, this body cream for dry skin is the hydrating 'skinfood' you were looking for.  GENTLE LAVENDER SCENT: You know many 'natural' body lotions still contain harsh chemicals, and it's felt as irritation, slick residues, breakouts and strong fragrance. So you'll appreciate knowing Shea Butter for Body is not just the best lotion for dry skin, it's skincare harvested from nature, including the relaxing Lavender oil. And for the perfect combo, add our face and body wash.
 All Wild, ORGANIC AND PURE: It's obvious this body lotion for dry skin is free from Toxins, Sulfates, SLS, Parabens, Silicone, DEA/MEA, Gluten and Artificial Fragrance. It's Dermatologist Recommended, it's Hypoallergenic and also safe for kids. The best part is that it's Vegan, Cruelty Free, Fair Trade, and Sustainably harvested in eco-reserves in Taiwan, protecting local habitat.  TRIAL IT & FEEL [YOU KEEP THE FREE GIFT]: Your order today also comes with a free wild soapberry! It's a wild and natural moisturizer containing a high amount of saponin for a gentle cleansing lather, naturally antibacterial and antifungal. Once you've discovered its wild beauty, take your body moisturizer and massage away the day's stress. Love your Shea and Soapberry Skin - or we'll refund every cent. This product is packed with the goodness of nature: colloidal oatmeal, chamomile, cocoa butter that nourish your skin, but also contains wild soapberry, which balances the pH, enabling your skin to manage its own moisture! The soapberries are harvested all the way in ecosystems of Taiwan, are wild, sun-dried and separated. This amazing product is perfect for your dry skin, because it hydrates and calms it and leaves moisture without any residue. Sustainable, cruelty-free, vegan and ecosystem friendly. Wild, sun-dried soapberry free with this product! Balances skin pH, enabling it to balance its own moisture. Works best for skin affected by winter dryness, eczema and on dry hands and feet. Calms and hydrates the skin naturally. The product is gentle enough to be used as a facial moisturizer too. Some customers have complained that the product doesn’t do much for them. By now you will have a working knowledge of what to look for in a body lotion. Don’t get distracted by glossy advertisements and assume that high-cost products are better. There are a great many body lotions that are inexpensive and do the job of hydrating and nourishing your skin perfectly. Though, always remember that what has worked for others might or might not work for you. Another way to go about is to look for free samples that you can try before buying. With a little trial and error, you will find that ideal body lotion that is perfect for you!